Nothing says “Family” like these artists! Born or associated with country musics greatest artists, these 6 performers come together for an evening of family favourites as only they can perform them. 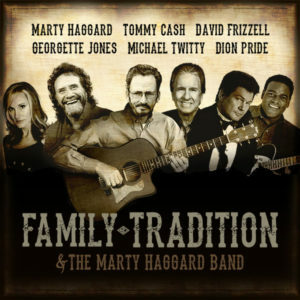 Mary Haggard, Tommy Cash, David Frizzell, Georgette Jones, Michael Twitty and Dion Pride, perform their own family hits in this spectacular family show. Backed up by “The Marty Haggard Band”, this show will be a crowd pleaser all year round. Tamala Georgette Jones (born October 5, 1970), who is a talented country and western singer and the only daughter from Country Music Royalty – George Jones and Tammy Wynette Georgette worked as a registered nurse for 17 years. She currently keeps her Nurses license renewed yearly just as her mom did with her Beauty Operator’s license. Georgette has released a few successful albums. Dion played lead guitar and keyboards for his father, and opened His Father’s show for 5 years, but while touring on his father’s show, Dion began to incorporate some of his own material. The audiences were so responsive that Dion decided to strike out on his own and has not looked back.